Mahindra Scorpio over the past fifteen years continues to be one of company’s most successful SUVs. Scorpio was the first such car introduced in the subcontinent back in the year 2002, and since then, it has received timely updates. The manufacturer rolled out the second generation model in 2014 that helped the car to further strengthen its fan base. The vehicle became plusher as well as comfortable and that too in the affordable price tag. Now the Scorpio with the latest avatar gets vivid changes inside and out with changes under the hood as well. With more power, more features and extra attitude, this time around, Mahindra Scorpio adds some more strength to its popularity. Like we already mentioned above the test mule of the facelifted SUV was spotted a couple of times and from the spy shots of the test mule, it is quite clear that the facelifted SUV will get all the changes mostly towards its front and rear profile.The front profile of the SUV will feature a restyled bumper which might get some bigger air inlets to make it look premium and slightly more aggressive. Apart from the new bumper expect the facelifted SUV also to get a slightly redesigned grille as well. Many reports are saying that Mahindra might redo the headlamps, but we firmly believe that the daytime running lamps styling won’t change much. Apart from these changes to the front profile, there won’t be any changes made to the side profile of the SUV. However, we do expect it to get a new set of alloy wheels to enhance its exterior styling. Just like the front profile the rear profile of the SUV will also get some styling updates as well which might come in the form of slightly redesigned taillamps and rear bumper. The all-new 2017 Mahindra Scorpio has been given an improved cabin. The current generation version of the car looks more premium and gets dual tone color scheme and numerous added features. The car seats are covered with new black artificial leather upholstery, the top spec models get luxurious black faux leather seats with dark blue fabric inserts while the gear knob, as well as steering wheel too, are leather wrapped. The driver’s seat is height adjustable for a better driving experience. Temperature control is fully automatic that maintains the preferred environment inside the car. AC vents too are improved for better airflow and uniform cooling in the cabin. Other features in the car are carried forward from the outgoing model that includes 6-inch touchscreen infotainment unit with navigation, AUX and USB connectivity and smartphone pairing through Bluetooth. The SUV is nothing short of comfort features which include cruise control, rear parking camera, climate control, keyless entry, electrically adjustable rear view mirror and rear parking sensors. The carmaker has also addressed issues with storage spaces with 12V socket now repositioned, pocket for mobile behind gear knob and sunglass holder. Now, there is also a fair chance that Mahindra might also introduce a petrol variant of the Scorpio as well which is still a hush matter even at this moment. Mahindra in collaboration with Ssangyong is working on a petrol engine which might be launched when Mahindra introduces the facelift variant in India.The base variant which is powered by 2,523cc, 4-cylinder m2DICR turbocharged diesel engine is able to deliver ARAI certified 16kmpl. On the other hand, 2,17 9cc mHawk turbocharger diesel returns 15.37kmpl. The same engine in different state of tunes in the higher variants delivers 15kmpl which is not bad either given the size of the SUV. The Scorpio’s biggest USP is its driving dynamics. It drives just like a hatchback and you even sit higher in a command position, which is what most of the Indians like. The Scorpio’ ride is decent, however it is on the softer side and also long suspension travel. The ride is smooth and composed on smooth tarmac and doesn’t even feel bouncy at high speeds, which was a problem in the leaf spring Scorpio of the early 2000s. However, it is a tad jittery on rough and uneven surfaces.The handling on the other hand is decent for city driving. There is lots of roll in the body, when driven quickly around bends. The steering wheel is also heavy at low speeds, which increases the effort to park. The new Mahindra Scorpio is a notch above in terms of braking capability. The car gets the latest Bosch ABS 9.1 system with bigger disc, bigger caliper and bigger brake pads, imparting confidence even when you are driving at high speed. Dual airbags and ABS are now standard fitments across all the variants save the base variant. The new platform makes the car crash-ready with energy absorbing crumple zones. Other safety features include engine immobilizer, central locking, and rain sensing wipers. 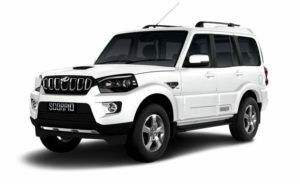 Mahindra Scorpio On-Road Price in Hyderabad ranges from 10,91,503 to 19,57,102 for variants Scorpio Getaway 2WD and Scorpio S11 4WD respectively. Mahindra Scorpio is available in 8 variants and 8 colours. Below are details of Mahindra Scorpio variants price in Hyderabad. Check for Scorpio price in Hyderabad at Carzprice. The Mahindra Scorpio facelift like we said will be launching towards the end of the year 2017 and most probably towards the festive season. The SUV will be getting mild updates to its exterior as well as interior while there won’t be any changes made under the hood. There is a slight possibility of Mahindra introducing a petrol variant alongside the diesel version while it will surely get a new 6-speed automatic transmission as well.